“This big red male won the Bundessieger title in 1963. He was a very nice male with a short firm back, excellent chest and a well-shaped head. Jago: sire of the von der Elgenbergwiese “C, E” litters (Cliff, Esther). Jessy: SchH 1 and dam of the von Ellendonk “M, V, O” litters (Vesta: DV-Siegerin in 1972). Jenny: SchH 3 and often V1 rated in conformation. Foundation female and dam of the von der Räuberhöhle “B, C” litters (Boris, Butler, Bessy, Cora). Kora: SchH 1 and Bundessiegerin in 1970. Afra: SchH 3 and dam of the von Ellendonk “S” litter (Sanko, Satan). 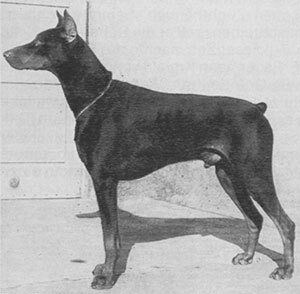 Ali: SchH 1, Bundessieger and sire of the vom Forellenbächle “C, D, P” litters (Prinz, Pina) and von der Veste Otzberg “D, F” litters (Dixi). Arabella: Bundessiegerin and dam of the vom Forellenbächle “M, N, P” litters (Milo, Prinz, Pina). Quelle: SchH 3, FH and passed the ZTP with 1A rating for character and SG for conformation. She is dam of the vom Gaxhardter Wald “B, C, F” litters (Cliff). Renne: sire of the vom Wehrwinkel “C” litter (Czilla). Ingo: sire of the vom Schonnerhof “A” litter (Assi).